Multiple myeloma involves abnormal plasma cells producing abnormal antibodies which can cause kidney problems and overly thick blood. The EC decision to approve Revlimid as monotherapy for multiple myeloma in the post-ASCT setting was based on the results of two cooperative group-led studies, CALGB 1001049 and IFM 2005-02. A review of the literature showed that the clinical features of IgD multiple myeloma are similar to those of IgG multiple myeloma, IgA multiple myeloma, and light chain myeloma. The treatment of choice for previously untreated multiple myeloma is chemotherapy. 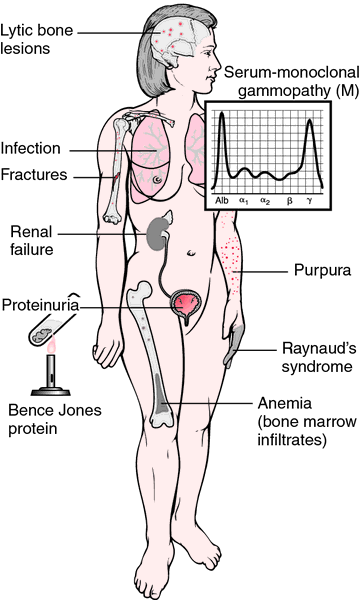 Multiple myeloma is the second most common blood cancer, behind lymphoma. 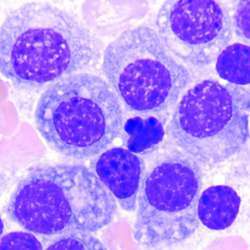 Multiple myeloma -- cancer of bone and marrow plasma cells -- accounts for 1 percent of all human cancers. PVX-410 is composed of four proprietary, synthetic peptides that target specific antigens found on the surface of multiple myeloma cells. The study shows patients with multiple myeloma cancer who took the drug, known generically as pamidronate and sold as Aredia, needed less radiation and surgical treatment and suffered fewer broken bones and paralyzing spinal injuries than those given a placebo. Millennium: The Takeda Oncology Company today announced that the Multiple Myeloma Research Foundation (MMRF) has named Millennium as the first recipient of the MMRF Collaborator Award. Takeda Pharmaceutical Company Limited today announced Takeda Canada has received approval from Health Canada for NINLARO (ixazomib) capsules in combination with lenalidomide and dexamethasone for the treatment of adult patients with multiple myeloma who have received at least one prior therapy.